Anne Bayefsky, the Director of the Human Rights Voices NGO and the Touro Institute and Human Rights and the Holocaust, attempted to give a rebuttal to the testimony of Canadian Law Professor Michael Lynk, who accused Israel of using disproportionate force against peaceful protesters during the 'March of Return' riots along the Gaza border over the last year. "The contrast between the outside and the inside of the United Nations today was wild. 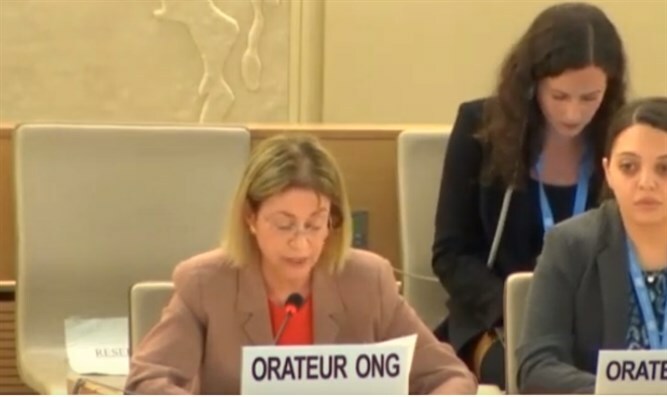 At the UN “Human Rights” Council, I attempted to draw attention to the horrible murder of Ori Ansbacher because she was a Jew, and the absence of any mention of her by the UN’s Israel investigator who claimed he was reporting on the “current human rights situation. ” The Council President’s response? He cut my mic! He interrupted me twice, calling my remarks naming the Council “expert’s” analogies of Israelis to Nazis “insulting.” I “insulted” anti-Semites by attempting to draw attention to their anti-Semitism. As I would have ended my statement - if I had been allowed to speak - At this UN, anti-Semitism is not a problem. It’s a human right," she said. Lie One: the Gaza so-called "demonstrations" have been "largely peaceful"
Lie Three: the purpose of what are actually riots is the right to "return" con, not Hamas' stated goal to lay waste the Jewish state. First, demonize the Jewish state. Lynk's Nazi and antisemitic tropes include claims that the Jewish state has an "appetite for territory" and "acquisitive purposes." Second, push a boycott of the demonized Jewish state. Lynk describes "calling for boycotting Israel" as "legitimate work." Third, criminalize the self-defense of the Jewish state. Would-be Palestinian killers aren't sufficiently successful for Israel to satisfy Lynk's proportionality parody. There is a real-life final step to this anti-Semitic UN formula. More Jews die. Early this year 19 -year-old Israeli Ori Ansbacher was raped and butchered by a Palestinian because she was a Jew. Her murderer is now entitled to a Palestinian reward. Ori isn't mentioned in the Lynk report on the "current human rights situation." Nor is any Palestinian terror, or fiery devastation of forests and farms. Instead, Lynk brags his report only "focuses on violations committed by Israel." At this UN, anti-Semitism is not a problem. It's a human right.